Venona intercepts indicate that Soviet GRU officer/State Department official Alger Hiss was awarded the USSR Order of the Red Star (above) after the Yalta conference. Readers of the often-perverse National Review will have noticed that FDR biographer and convicted felon Conrad Black has opened an extended firefight with Angelo Codevilla over Codevilla's review-essay in the Claremont Review of Books about Henry Kissinger's recent book. As the majority-European-minority-African experiment that made America disappears into a Third World maelstrom of population-replacement and culture-eradication, the question, as we approach 2016, is whether there remains enough patriotism -- love of country that is also openly declarable -- to try to save it. Campaign Diary: Donald Crumples? Walker's "McCarthyism," and Hillary's "Enthusiasm Gap"
"During Iowa campaigning, Clinton confronts enthusiasm gap." As I have learned, and particularly since the publication of American Betrayal, history is far too important to be left to professional historians content (ordered?) to trudge along the familiar groove of false narrative (until roused to any-means-necessary search-and-destroy missions against those who venture off-road in search of buried truth). This is a matter of more than academic import. It is of much wider concern than to students or buffs. History is, should be, the guidestar of our conduct as a nation.The fact that we founder so dangerously today is directly related to the continuous loop of falsehood and misunderstanding about exactly how we got this way. Watch the video (click "Read More" below). Read Sharyl Attkisson's Fact Check. Donald Trump has absolutely nothing to apologize for, even before we turn our attention to all of the noxiously fake concern currently being avowed by the Establishment-Political-Media-Complex for the plight of the American POW as exemplified by Sen. John McCain -- who himself has done more than anyone to cover up the plight of American POWs who did not return home! In other words, where was all of this now-pained, -etched, and -so-serious concern for POWs then? Nowhere. It just wasn't a useful mechanism of the political agenda. Today, that agenda is to Get Trump, and by any means necessary. Even by making and blowing things up, drenching them in crocodile tears, hoisting an American flag over the steaming mess, and saying Trump, the candidate leading the way on a real border, immigration control, and maybe even survival as a nation, "crossed the line" and, thus, according to the Establishment-Political-Media-Complex, is out. 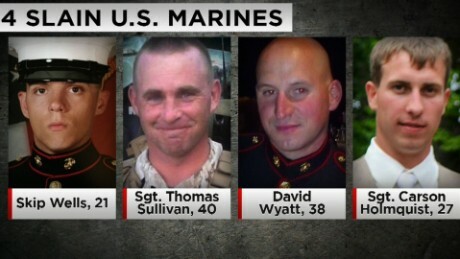 Another American serviceman, U.S. Navy Petty Officer Randall Smith, has died of wounds inflicted by jihad-killer Mohammad Abdulazeez, bringing the Ramadan 2015 death toll in Tennessee to five. America also despairs. No one in power, no one with authority, no one with ratings, has the honesty and courage to link the killer to his religious faith, Islam. This seemingly unbreachable wall between cause and effect, between fact and conclusion, has created psychological, political and also spiritual chaos in the land. Kudos to CBS's Major Garrett for asking Obama a piercing question about Iran's four American captives -- bonus: CNN's Dana Bash calls it "disrespectful! Transcription of exchange between CBS News Chief White House Correspondent Major Garrett and President Obama over Iranian hostages. Czech and US soldiers patrolling Parwan, Afghanistan, 2014, for no good reason. They are still there. There is no mission. There is no strategy. But 13,000 US and NATO troops are still risking their lives and limbs every day in Afghanistan. Even worse, as the Military.com story excerpted below makes clear, these forces are operating in a war zones under rules of conduct befitting a peacetime police force. Bonus: in one example reported below, when the going gets tough, there is no Afghan support. No doubt, another letter to another editor of another journal about another knock-out game on American Betrayal is just the thing for the summertime hammock, particularly since this one, bonus, also manhandles Stalin's Secret Agents by the late M. Stanton Evans and the late Herbert Romerstein. How Did We Go From "Independence" to "Interdependence"? If July 4, 1776, is our Independence Day, March 11, 1941, is our Interdependence Day. A revolutionary thing happened on the way to World War II. It was called "Lend Lease." This was the legislation, approved on March 11, 1941, by which the neutral USA began to supply aid to countries at war with Hitler. It was spun by President Roosevelt and Democrats in Congress as a means of keeping America out of World War II, although it was recognized by many Republicans at the time as a war bill. But that's not all. Lend Lease granted extraordinary powers to the executive. Indeed, it transferred war-making power from the Congress, where the Constitution placed it, to the president, where it has pretty much remained ever since.